Time for a skeleton dance. Synapse, seen here doing user skeleton tracking on the Mac. While we wait for Microsoft to send the new Kinect – yes, we’re on the list for one here at CDM HQ – there’s still plenty to be done with the current generation of Kinect. And it’s likely that you’ll find even more of these on the cheap when there’s new hardware out there. With these tools, it’s possible to get a driver-free installation or something with a straightforward driver installation, and generate OSC (OpenSoundControl) messages that can be read by any visual software (or, with a little more effort, any music software). Synapse by Ryan Challinor is a ridiculously simple, ridiculously effective solution. It simply bundles together the data you most need – joint information from the skeleton tracking – and fires it off as OSC messages. Better still, there are already examples for Quartz Composer, Ableton Live, and Max. So you can begin playing with it right away. (I’m working on one for Pd; stay tuned.) Little wonder it works well: Ryan is at Harmonix and built the gesture menu for Dance Central. Bless you, yet another geek willing to keep geeking out after work hours end in the name of digital art. The only caveat: Ryan reports hardware labeled Kinect for Windows and even some newer Kinect for Xbox hardware may not work; I’m investigating. 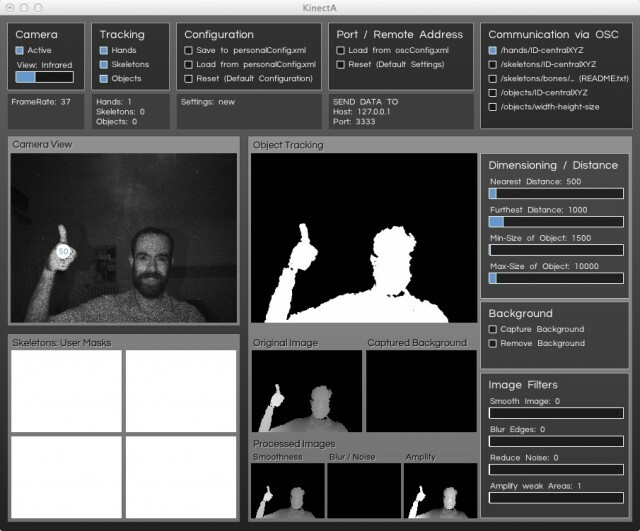 KinectA goes further. Like Synapse, it’s install-free on the Mac and requires some reasonably-manageable driver installs on Windows. 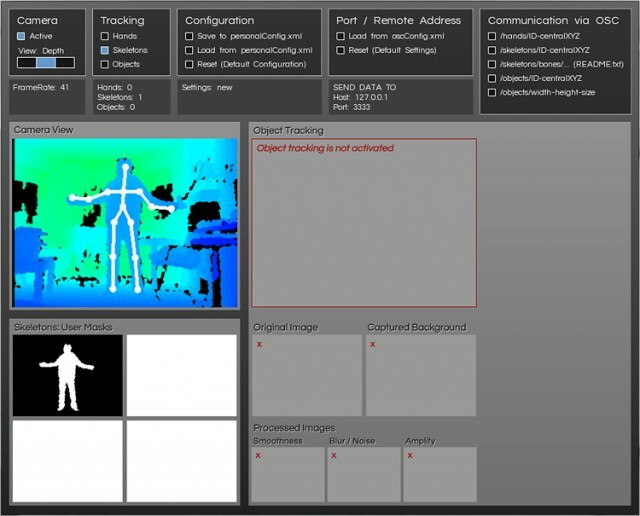 But it allows you to choose between object tracking, hand tracking, and skeleton tracking. That’s a bonus, as skeleton tracking requires the infamous “goalpost” gesture before it starts working, and can cause any number of problems in installation situations with users – especially multiple users. Sometimes simpler tracking works better. As with Synapse, all of this is sent out as OSC – and again, I’ll work on some Pd patches for you to parse the results (and maybe Processing, if I have time). With multiple tracking methods on, this was pretty hard on my (mid-range, 2010) i5 on my MacBook Pro, but it’s still promising. 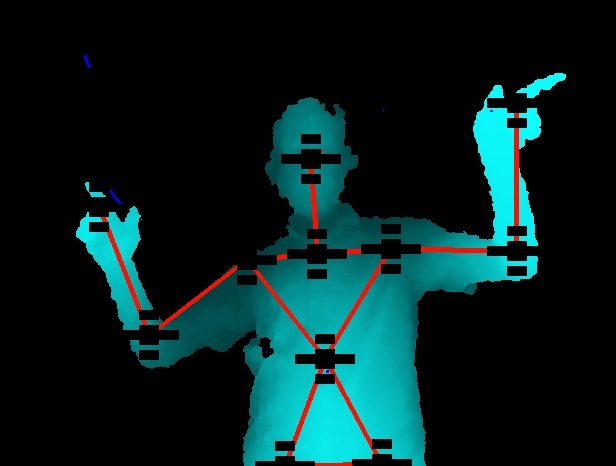 Tracking skeletons in KinectA. Courtesy the developer. Those two are the only two that allow driverless install on OS X, but I should give an extra nod to the rather-popular OSCeleton. It does require the OpenNI driver install on all three operating systems, but if you are serious about tinkering, you may want to bite the bullet and do that. And there is a package available that gives you the whole setup on Ubuntu Linux, if you don’t care to build from source (though I suspect Linux may be the easiest OS to deal with in that regard). Even with the installation and my aforementioned apprehension about dealing with students or friends on (cough) troubleshooting, what you do still get is a bunch of OSC messages you can process – and there are examples in Pd already built for you to begin working with the data. So, this would absolutely be my first choice if I were anxious to tinker quickly on Linux, and possibly on other OSes, as well, depending on needs. Expect some documentation after the fact. Now, I’m very keen to hear from readers. What are you using? What hasn’t worked; what have you found frustrating? What has? Are you working as an individual artist, student, teacher, pro? Are you building Kinect apps for Harmonix?